enough to open his airway. He slows and falls to the back of the pack. unseen, slowly wearing down the nerves that stimulate the muscle responsible for opening the larynx. Taking roaring by the reigns, Dr. Cheetham and the Equine Performance Clinic team are helping to change how veterinarians look at and treat the disease. The team running the Clinic’s indoor treadmill offers good client service while researching new methods to diagnose disease earlier and improve treatments. According to Cheetham, the horse is a useful preclinical model of human airway disease. Much of what he is learning and working out at Cornell could help restore function in human patients with laryngeal disease. 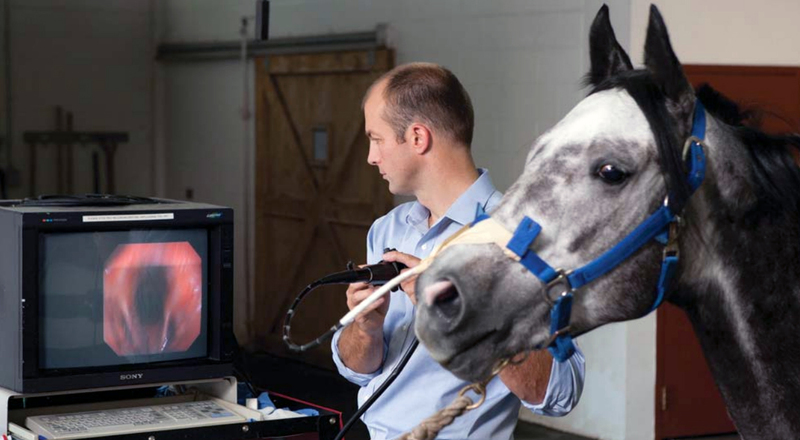 The Equine Performance Clinic pioneered techniques using a trans-esophageal ultrasound to evaluate airway muscles in horses. Developed at Cornell with support from the Harry M. Zweig Memorial Fund, these techniques could give human doctors a new view of deteriorating laryngeal muscles and let them follow progress after treatment. The team is developing a novel treatment for roaring using a laryngeal pacemaker to electronically stimulate the muscle and maintain its function: another technology applicable to humans with vocal paralysis. Cheetham has spent the past year developing new ways of detecting neurological disease earlier, thanks to a grant from the Grayson Jockey-Club Foundation. Placing tiny needles into the nerves, Dr. Cheetham measured conduction speeds across their length to see how speeds vary across the nerves. Next he will validate a technique that does not use needles and look at how nerve conduction velocity at the weanling stage affects performance of 2-year-old horses with the hope of confirming it as a viable diagnostic and predictive tool. Validating such a test would expand the window of detection and open doors to earlier prevention and treatments, and aid understanding of the disease mechanisms that produce ‘roaring’ in horses. 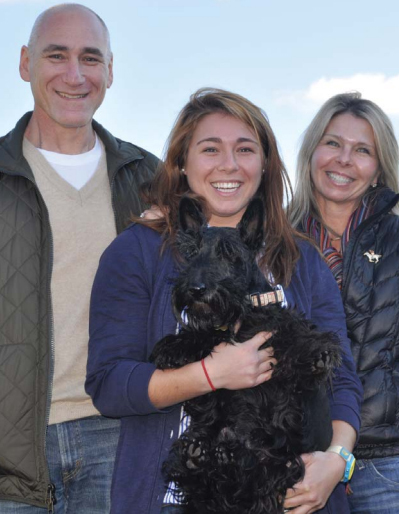 When their dog, Buzz, faced a life-threatening condition in October 2009, Richard and Stacy Hoffman drove their Scottish terrier six hours from Maryland to Cornell University Hospital for Animals, where a timely surgery saved his life. Their experience inspired several donations to the Companion Animal Hospital, and as strong supporters of animal welfare they were keen to learn more about the College’s commitment to animal care. The Hoffmans oversee a family foundation that funds projects supporting otherwise overlooked wildlife. When they took a tour of Cornell’s Janet L. Swanson Wildlife Health Center, which provides hospitalization and medical care to sick or injured wild animals brought in by the public with the goal of releasing them back to their original habitat, they knew they had found a match. Through a gift from their foundation, the Hoffmans helped the Center purchase four pieces of imaging equipment that will provide invaluable diagnosis and treatment options for the animals treated at the Center while simultaneously building a multimedia library usable for teaching and research in wildlife medicine. For their tiniest patients, the Center purchased a fully functional miniature endoscope. Finally, all endoscopes were updated with new, more powerful light sources. The Hoffmans hope their gift will help veterinarians, students, and researchers find ways to prevent future problems in wildlife and promote research to help wildlife. When you need to see “guts,” endoscopy gives the inside scoop. Recent advances in endoscopic technology have led to smaller endoscopes that can go further into the body, see more clearly, take bigger samples, and serve a wider array of patient needs. The gastroenterology section of Cornell’s Hospital for Animals now utilizes new lines of updated fiber-optic technology. The first-ever slimline large-channel portable veterinary endoscopes can connect to a lightweight laptop and easily be moved to an animal. This makes them particularly useful in surgery or for bringing to animals that should not be moved. When flexible endoscopy is not the answer, it may be time to swallow a pill. Wireless capsule endoscopy provides high-quality imaging throughout the entire GI tract without requiring anesthesia. Each single-use “Endo capsule” made by Olympus employs a tiny camera that takes pictures all the way through the digestive system and transmits data wirelessly to a receiver worn by the patient. The gastroenterology and parasitology sections have teamed up to use capsule endoscopy for research sponsored by pharmaceutical company Novartis to safely validate anti-parasitic drugs. Slimline large-channel biopsy-capable endoscopy, portable endoscopy, and capsule endoscopy are now available for clients and referring veterinarians. Hours before she was scheduled to leave for vacation, Dr. Nita Irby received a distressed call in the ophthalmology service. Trixie, a beloved miniature potbellied pig, was suffering from an undiagnosed painful eye problem that had been ongoing for several months. Irby agreed to see the pig and in May 2011 Kathy Ruttenberg, a successful artist hugely inspired by her relationships with her adored pets, drove Trixie four hours to the Cornell University Hospital for Animals (CUHA). Unfortunately, a week or so after the eye healed it became painful once again and Trixie returned to the CUHA for a second examination. “From the moment I first called, Dr. Irby was there for us”, said Ruttenberg, who contacted the Hospital wanting to donate in Irby’s honor shortly after the initial visit and soon decided to fund the purchase of a new phacoemulsification machine used by the ophthalmology service for cataract removal surgery. Ruttenberg is well known for her love of animals, which has been the subject of several news articles, including one in The New York Timescovering her habit of sleeping with Trixie and others from her menagerie of 70 animals in her mountain home in upstate N.Y. Her generous gift to CUHA will help many animals live better quality lives. CUHA has upgraded its Magnetic Resonance Imaging (MRI) capability, offering unprecedented opportunities for advanced medical imaging. As part of the Janet L. Swanson Imaging Suite, the MRI and the recently installed 16-slice Aquilion LB CT scanner mark a huge leap forward in the Hospital’s clinical and research capacities, continuing CUHA’s commitment to innovation. The 1.5T Toshiba Vantage Atlas MRI scanner employs a high-field magnet capable of scanning any animal up to the size of a large dog, some large farm animals, and the limbs or heads of horses. A moveable table allows an anesthetized horse to be brought close enough to the magnet to scan those parts that can be pulled into the bore. Most veterinary colleges have similar systems though this model has the latest software and hardware available at 1.5T field strength. It is a “work-horse” scanner in the human imaging field. Summer renovations at the Hospital ensured that the MRI can be operated with optimal efficiency and safety. The control room provides easy viewing of the scanner and patient and connects to a fully equipped anesthesia room for small animals. Equine anesthetic induction and recovery stalls are adjacent to the scan room. A large door at the back of the exam room opens directly to the large animal hospital, making it easy to accommodate imaging needs for equine and other large animals. A full complement of MRI-compatible monitoring equipment keeps anesthetized patients stable throughout the exam. The Toshiba MR and CT scanners comprise the Janet L. Swanson Imaging Suite and are now operational and available for CUHA patients by referral. Small animal MR scans are available daily. Horse scanning is progressing and protocols are under development. 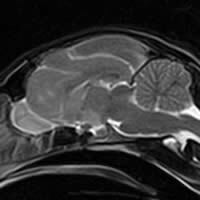 Veterinarians who would like to discuss the use of these modalities for their patients are welcome to contact the Imaging Section at the CUHA for advice and referral information. Please call 253-3060 for appointments or -3241 to have a radiologist consultation.